The 2013 Asian Continental Chess Championship for Women was held on 18-26th May in Manila, Philippines. The tournament was organized by the National Chess Federation of the Philippines and Eugene Torre Chess Foundation, Inc. A total of 40 players from 9 countries took participation, among them 12 WGMs, 2 IMs and 9 WIMs, according to a Chessdom report. It was an exciting race between Huang Qian and Tan Zhongyi, both from China, who finally finished the tournament on 7,0/9 points each. 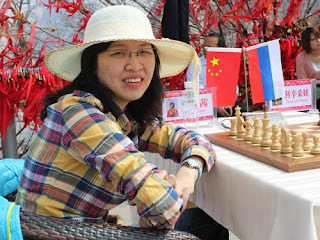 However, Huang Qian took the title of Asian champion on better tie-break and qualified for the next Women’s World Chess Championship. The third place at the chess championship went to WGM Mary Ann Gomes from India who stood her ground among the Chinese players to claim clear third place with 6,5/9 and take the bronze medal. Gomes also jumped over 2400 elo and finally fulfilled requirements for IM title. Is she a Vietnamese chess player or chinese?